Mensur Suljović won his first World Series of Darts title in front of a packed crowd, when he put in an amazing performance to beat rising star Dimitri van den Bergh 8-2 in the German Darts Masters last Friday - 25th May. Suljović and Van Den Bergh had both already defied the bookies odds with their routes to the final, with the former knocking out last year’s champ Peter Wright and the latter dispatching title favourite Martin Van Gerwen, so all bets were off as the final took place and punters excitedly scrambled to make their choice on who would be the victor. During the first round of play in the afternoon, Suljović had defeated Robert Marijanovic 6-2. He then came back and edged out world champion Rob Cross 8-7 before his win over last years’ champ Peter Wright. In the final, he averaged 101.63, scored five 180s and hit eight doubles before he finally overcame his young opponent. He took an immediate lead in the final, though van den Bergh came back to take the third leg. In leg seven a double 16 saw another comeback from Van Den Bergh, but Suljović came back to lead 6-2. He finally sealed the title with a 76 finish, scoring one of his favourites, a double 16. Speaking after the win, he said "It's a great feeling for me and I'm really happy. Dimitri is a brilliant player and it was a long day, but I did well. The crowd was brilliant and to win this tournament makes me so happy. People have been playing really well against me recently but I had a good feeling and it was a great day." 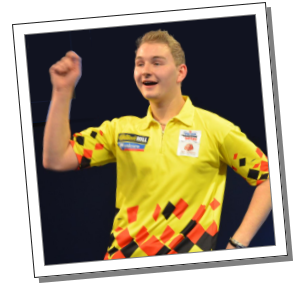 Van den Bergh who also happens to be the world youth champion had earlier comprehensively beaten Martin Schindler 6-0 and although he only got to ninety-four in his quarter-final, it was still enough to thrash Premier League Darts king Michael van Gerwen. There he averaged ninety-two in comparison with compared to Gary Anderson's nighty-eight in the semi-finals. However, he still came out on top in the 8 nail-biter that saw him nail an amazing 124 checkout, coming hot on the heels of the Flying Scotsman’s 180. Anderson had previously overcome Gabriel Clemens and the World Championship semi-finalist Jamie Lewis whilst making his way to the last four. Wright had dispatched Dragutin Horvat and Raymond van Barneveld on the same day. Van Gerwen beat Max Hopp by 6-4 and Van Barneveld had totally whitewashed Manfred Bilderl, Cross, he previously being a 6-4 winner over Stefan Stoyke and Lewis coming from 3-0 down to edge past Nico Kurz. This year’s German Darts Masters was the opener of what are going to be six global events being held on the PDC's World Series of Darts circuit throughout 2018. The second US. Darts Masters is going to take place in Las Vegas in July before the World Series of Darts returns to action, before finally heading to Shanghai.